This topic explains how to implement a custom image that you can drag to the taskbar to pin a site. Any image format can be used as a drag-to-pin image, but we recommend you use the same .ico file that you use for your site icon. Standard image formats, such as PNG, GIF, or JPEG files, also work. When Windows Internet Explorer 9 or Internet Explorer 10 detects an image that has this class, it automatically provides the drag-and-drop functionality. Be aware that the site icon (not the drag-to-pin image) is used as the image in the drag operation. If you do not declare a site icon, the default Windows Internet Explorer icon is used instead. For the best user experience, your drag-to-pin image should be the same as your site icon. For more information, see Customizing the Site Icon. There are a few more things you can do to improve the discoverability of the drag-to-pin image. The best thing that you can do is to make sure the image that appears can be dragged, by changing the default cursor to a hand cursor icon when the user moves the mouse pointer over the image. The following CSS first attempts to load a custom cursor before defaulting to the hand pointer. A more advanced implementation might proactively call attention to the drag-to-pin image by displaying a callout when the page loads and when the user moves the mouse pointer over the image. Callouts can help explain how to use the image to pin the website. Finally, the following CSS finishes the callout effect. Be aware that the #pinContainer element is initally hidden with display:none. This is its default state. The drag-to-pin image is unnecessary if the browser is not Internet Explorer 9, if the site is already in site mode, or if scripting is disabled. 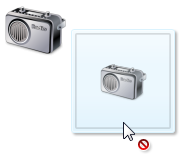 By default, the image should not be displayed in these cases. // Fail silently. Pinned Site API not supported. Because the #pinContainer container element might be embedded in body text, the preferred display type is inline-block. It is also possible to float the container left or right to wrap text around it. In the next task, Creating a First-run Experience, you learn how to detect when a site has been launched for the first time. This provides an opportunity to tell users about other Pinned site features of your website.